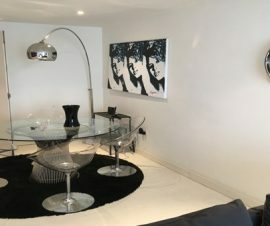 Featherstone Street Deluxe Apartments, Old Street: In the heart of Old Street, within walking distance to Shoreditch and Islington these apartments provide modern, comfortable accommodation and the perfect gateway to experience London. 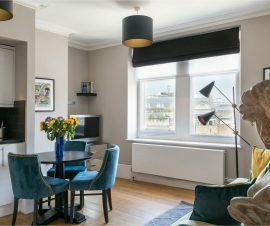 Take advantage of this apartment’s great location and excellent transport links to go out and about the city – whether you are in London for business or leisure, this apartment will offer you the best of London. The apartments are equipped with all the modern conveniences to make your stay truly comfortable. We provide free and unlimited business broadband to keep you connected. During your stay our team will be available 7 days per week, and 24 hours per day for emergency support. 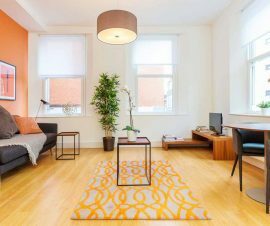 Enjoy the comfort of your own private apartment, with the peace of mind that a professional team is on standby should you need assistance. Please select one of the unit types above to see apartment specific photos and amenities.